As viewers, we do not get to see a thorough look at the behind-the-scenes process on Pixar films. Special features on Blu-ray/DVD releases and featurettes shared online give us but a glimpse of the years of work and thousands of pieces of artwork that are drafted up by those working on the film. The “Art of…” books for Pixar films shine a light on the concept art and other pieces of pre-production artwork, showcasing them on big glossy pages in a beautiful oversized hardcover. The art book for Monsters University is up next and its cover design was just updated with stunning new concept art, which you can see after the break! 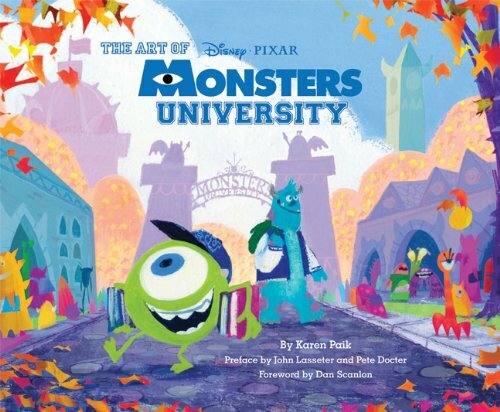 Pixar Daily noticed (via Pixar News) that Amazon has updated the cover for The Art of Monsters University. It must have been changed later in the day yesterday, as I visited the Amazon listing yesterday morning and saw that the first cover had been removed and had been filled with blank space, awaiting this new updated look. The new cover features previously unreleased concept art of Mike and Sulley on the campus of MU. This will likely be the final cover, as publisher Chronicle Books has, for previous art books, released a preliminary cover only to be switched out for a final version as the book’s release approaches.